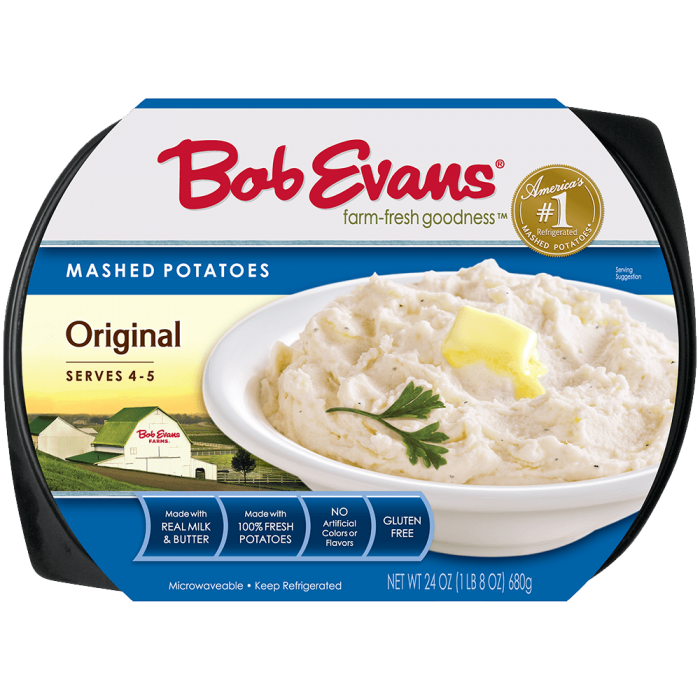 Combine Bob Evans smooth and creamy Original Mashed Potatoes with fresh jalapeños for an appetizer that will turn up the heat at your next party! 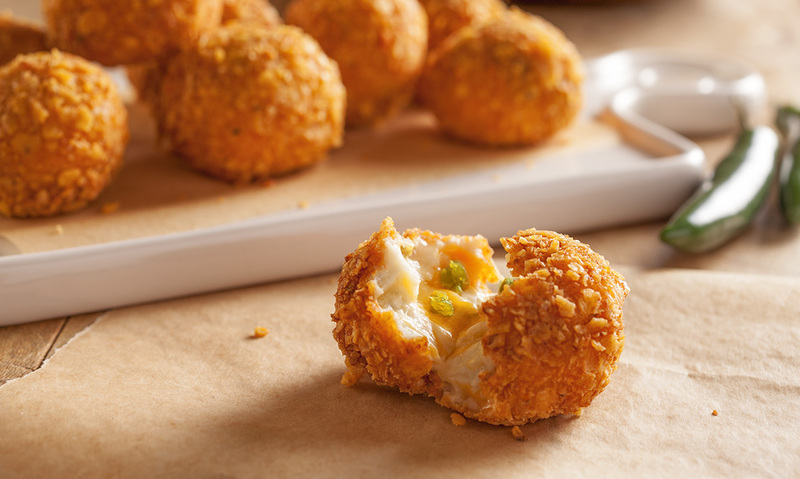 Stir together cold mashed potatoes with both cheeses and diced jalapeños. Scoop 48 tablespoonfuls of the potato mixture and set them on a parchment or wax paper lined baking sheet. Refrigerate for 15-20 minutes. Meanwhile, place tortilla chips in the bowl of a food processor and pulse to fine crumbs, or place chips in a large zip top bag and smash using a rolling pin. Pour crumbs into a shallow bowl. Beat the eggs and pour into another shallow bowl. Set aside. Heat oil in a fryer (or Dutch oven) to 350 degrees. Remove mashed potato scoops from refrigerator and roll into balls. Roll each mashed potato ball into the flour, tapping off excess. Once all of the potatoes are coated in flour, dip each into the egg, allowing excess to drip off, then into the tortilla chips, making sure to coat them evenly with crumbs. Set on a clean baking sheet. Discard any excess flour, egg and tortilla chips crumbs. Fry small batches of the mashed potato poppers in the hot oil until golden brown, 30-40 seconds. Remove from fryer and place on a paper towel to drain off excess oil. Repeat. Serve hot with sour cream, if desired. Poppers can be reheated in a 350 degree oven for 6-8 minutes. 1 Stir together cold mashed potatoes with both cheeses and diced jalapeños. 2 Scoop 48 tablespoonfuls of the potato mixture and set them on a parchment or wax paper lined baking sheet. Refrigerate for 15-20 minutes. 3 Meanwhile, place tortilla chips in the bowl of a food processor and pulse to fine crumbs, or place chips in a large zip top bag and smash using a rolling pin. Pour crumbs into a shallow bowl. 4 Beat the eggs and pour into another shallow bowl. Set aside. 5 Heat oil in a fryer (or Dutch oven) to 350 degrees. 6 Remove mashed potato scoops from refrigerator and roll into balls. Roll each mashed potato ball into the flour, tapping off excess. Once all of the potatoes are coated in flour, dip each into the egg, allowing excess to drip off, then into the tortilla chips, making sure to coat them evenly with crumbs. Set on a clean baking sheet. Discard any excess flour, egg and tortilla chips crumbs. 7 Fry small batches of the mashed potato poppers in the hot oil until golden brown, 30-40 seconds. Remove from fryer and place on a paper towel to drain off excess oil. Repeat. Serve hot with sour cream, if desired. Poppers can be reheated in a 350 degree oven for 6-8 minutes.